TaxHow has all the forms and eFile solutions that you will ever need for your Iowa State taxes. If you find any form that is missing for your State, let us know and we will make our best to update them immediately. 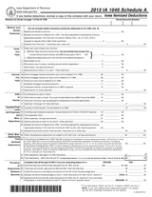 Iowa form IA 1040 is designed for state individuals to report their annual income. The form features space to include your income, marital status as well as space to report any children or dependents you may have. By filling out the form, you will see whether or not you owe money to the state or if you will receive a refund. 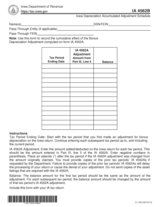 Iowa Form IA 1040X is a tax return document for taxpayers who need to amend their previous return. Also known as the amended individual tax return form, it is used to correct any errors in income, reimbursements or tax credits on a number of other Iowa IA 1040 tax documents. When filling out your IA 1040X form, you will be given the chance to explain why you are making an amendment in your tax return. Form 126 is a supplemental form to Form-1040. 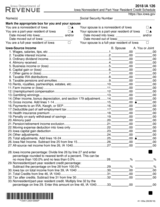 As such it is not required that you file this form, and if you do file this form, you must attach it to your Form-1040 in your tax return. Form-126 allows Iowa part-year and non-residents to calculate the amount of income that is deemed "Iowa Income" and is taxed by Iowa. 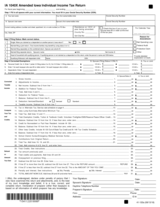 This form is important because Form-1040 taxes asks and taxes all income you earned. If you are a part-year or non-resident of Iowa chances are your state of residency will tax your income. Thus Form-126 allows you to avoid facing dual taxation by telling Iowa which income it can tax and what income it can't. Form IA 4136 may be used by nonresidents, residents, trusts and fiduciaries of estates to claim a credit on their Iowa income tax returns for fuel which was used by an unlicensed vehicle. Please keep in mind that you cannot claim a credit for dyed diesel fuel. Iowa Form IA 4136 must be filed and mailed together with one’s Iowa income tax return. Schedule 130 is a supplemental form to Form-1040. 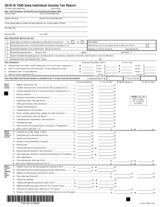 As such it is not required that you file this form, and if you do file this form, you must attach it to your Form-1040 in your tax return. Schedule 130 allows Iowa residents who work in another state to redeem a credit for taxes they were required to pay to other states. This situation would arise because most states tax all income that is earned in them (unless certain reciprical agreements between two states exist). Also Iowa taxes its residents on all income they earned, not just income earned in Iowa. This Iowa residents face dual taxation from Iowa (the state of residence) and the other state (where the income was earned). Schedule 130 exists to avoid dual taxation on such income by issuing a credit for any taxes paid to other states. 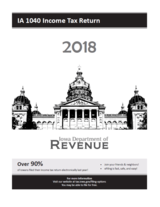 The Iowa tax booklet is a guide for state residents on how to file their state income taxes. The guide features step-by-step instructions on how to file by mail or e-file your state taxes. In addition, the booklet features information on every type of state tax form as well as areas where filers commonly make mistake. IA 4562B may be used by corporations or partnerships to file their Depreciation Accumulated Adjustment. Iowa IA 4562B must be submitted together with the Iowa corporation income tax return or the Iowa individual income tax return. 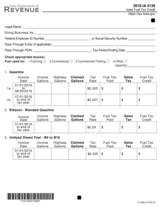 The short forms for Iowa individual income tax (IA 1040A) and Iowa corporation income tax (IA 1120A) will be discontinued as of tax year 2013. 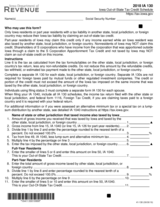 Taxpayers who may have used these forms in the past will need to use the IA 1040 or IA 1120 beginning in tax year 2013. Form IA 8453-IND may be used by taxpayers who want to authorize a return originator to complete a tax return on behalf of the taxpayer. The form also serves as an authentication of the return. 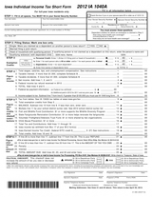 Iowa Form IA 8453-IND must be completed and signed before the tax return is submitted. 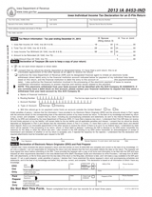 Form IA 8453-IND must be mailed with the following forms: •	Copies of W-2 forms. •	A copy of the tax return. IA 1040 Schedule A and B may be filed by Iowa taxpayers who want to report their Iowa itemized deductions and interest and dividend income. If the taxpayer is itemizing a deduction, he or she will need to attach a copy of the Iowa IA 1040 Schedule A to their tax return. Here are the mailing addresses available for Iowa. Please note that some specific forms might have a different addresses. Please check the Form's instructions before using any addresses listed here.